Lease the all-new 2019 330i for $439/month* + tax for 36 months. 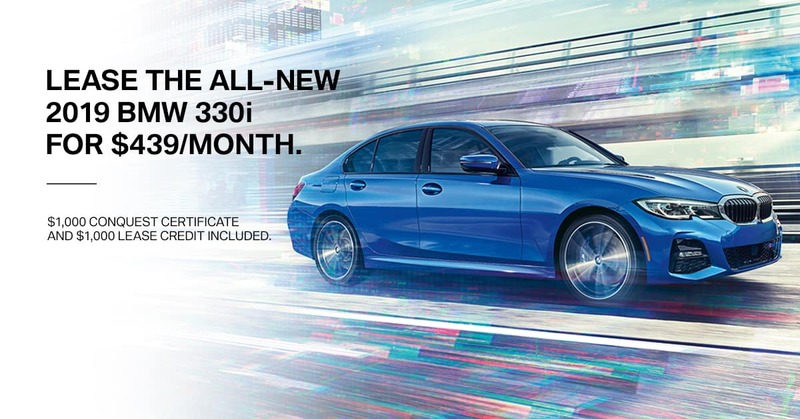 *Lease offer applies to all-new 2019 BMW 330i sedan models. Cash due at signing includes $3,000 customer down, first payment, tax, title, license, registration feeds, $596.20 dealer fee, and $925 acquisition fee. Monthly lease payments are $439 per month plus tax for 36 months at 10,000 miles per year. Valid through 4/30/19. Must be financed through BMW Financial Services to eligible, qualified customers with excellent credit history who meet BMW Financial Services’ credit requirements. All incentives and rebates included, including Loyalty, Corporate, and USAA. Please see your client advisor for details.